Watt Stopper/Legrand has released a new multi-location vacancy sensor and compatible remote control switch to help families save energy conveniently and cost effectively in rooms with more than one switch location. The RH-250 residential wall switch sensor is more versatile than any other product on the market, allowing customized control options including automatic-on operation from selected locations. The RH-250 is designed for applications requiring more than one switch location, such as stairways, hallways, large spaces and rooms with multiple entrances, including Jack and Jill bathrooms. The RH-250, and companion RH-253 momentary switch, replace traditional three- and four-way switches in these applications. Users can turn lighting on from any of the devices by pressing a pushbutton. When the space becomes vacant, and the selected time delay has elapsed, the lights turn off automatically, saving energy and reducing power bills. Each RH-250 uses advanced passive infrared sensing technology to detect occupancy in areas up to 600 square feet. As long as one connected sensor detects motion, the lighting will remain on. Each sensor can be set for a different time delay and selected sensors can be set for automatic-on operation if desired. This flexibility is unique to Watt Stopper/Legrand. The RH-253 allows on and off switching but does not include sensing capability; it should be used for a switch location in an area that will be sensed by a connected RH-250. This new option reduces the cost of multi-location sensor installations. 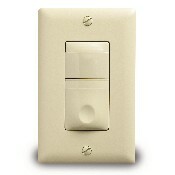 The RH-250 is part of Watt Stopper/Legrand’s line of residential occupancy-based controls that includes dual relay vacancy sensors and sensors with an integral nightlight or dimmer, along with user-friendly features such as backlit switches for easy location in the dark. The product family is available in four decorator colors, and each sensor lens matches the rest of the device. The low profile sensors protrude less than 3/16” from the wall plate.